The author has graciously shared with readers of the Victorian Web this passage from the second edition of her Fashion in Costume, 1200-2000 (2000), published by A & C Black (Publishers) Ltd., which retains copyright. Readers wishing to obtain the book can e-mail the following address: sales@acblack.com. The typical skirt of the 1850s was still dome-shaped; its slight reduction in size was concealed by the addition of flounces, on average three to five, edged with embroidery, a printed or woven pattern or velvet bands. As the decade progressed evening dresses were trimmed with more and more ruches, puffs, ribbons, flounces and lace. Max von Boehm, the social and costume historian, records that the Empress Eugénie appeared at a ball wearing 'white satin with one hundred and three "flounces" of tulle' (Die Mode 1841-1878). Tulle, net and tarlatan (a thin gauze-like muslin, much stiffened) were chosen for these vast flounced gowns which were subject to severe creasing during the evening's festivities and a considerable fire hazard. The late 1850s saw the skirt changing shape from a dome to a bell, the top hoops of the crinoline frame being reduced in diameter and the skirt gored so that it flowed out gradually from the tiny waist to the immensely wide hemline. The 1860s skirt was cut to flow and spread out at the back, the front hanging fairly straight over a crinoline frame adjusted to give this silhouette. Somewhat heavier materials were used in the 1860s and decoration was confined to the lower part of the skirt. Skirts were long, often trailing, but as early as 1857 they might be looped up for convenience when walking in the country or on the beach, and this led to an arrangement of cords and rings which enabled the skirt to be drawn up in festoons. Both methods revealed a petticoat which might be of a bright colour with applied bands of contrasting colour and stockings striped to match. By the mid-1860s this fashion was general in Paris for outdoor wear, and accepted by other countries for such activities as archery and croquet. A definite distinction was thus made between 'walking' and 'visiting' dresses, the latter remaining very long, and coloured petticoats were for informal wear only; otherwise they were white, as were the stockings. The years 1865-70 saw the decline of the crinoline, not without some resistance; its popularity had permeated all classes and it was regarded by many as indispensable. It was worn by peasant girls in the fields, maidservants and factory workers, as well as by the wealthy and fashionable; even actresses playing classical roles would not part with their crinolines, and guests at fancy dress balls happily appeared in what they thought of as medieval dress over crinolines! With the round and higher-waisted bodice of 1866-69 the crinoline became small and cone-shaped for day, worn under a dress cut shorter than a matching underskirt for walking — or this effect might be simulated by bands of ribbon in a contrasting colour. 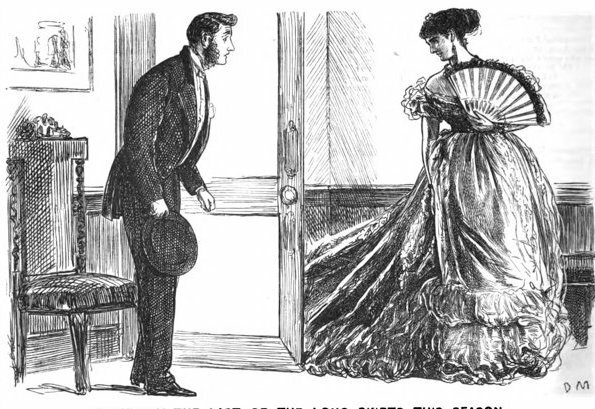 A short tunic or overskirt called a peplum, cut away at the front and back and hanging in points at the sides, was fashionable between 1866 and 1868; if worn with evening dress it might be called a peplum basque, being shorter and attached to a waist-belt. Evening skirts swept the ground and required a larger crinoline projecting at the back to support the train, though of modest size compared to those of the late 1850s and early 1860s. Sleeves were long and slim, neck-lines high for day or, if cut lower, filled in with a chemisette; the low d6colletage was retained for evening without a bertha, and sleeves were short and puffed or simply little draped sections of gauze or lace. When, earlier in the century, such women as Florence Nightingale or Mrs William Morris in England and Mrs Bloomer or Doctor Mary Walker in America discarded their crinolines for ascetic or practical reasons, they were considered eccentric, but in the late 1860s it was considered somewhat distinguished, if a little daring, to do so. Between 1868 and 1870 fashion wavered between straight and rounded lines. The highwaisted bodice and cone-shaped skirt were challenged by an outbreak of historically inspired fashions. The Antoinette fichu, usually of muslin or lace, covered the shoulders, wrapped across the breasts and tied in a long-ended bow behind; wide sashes were tied at the back with big puffed-out bows (wearing these styles women stood leaning slightly forward in an attitude called obscurely the Grecian Bend). There were suggestions of 17th-century lace collars and 18th-century paniers, and these concoctions were not confined to the ball-room; an outfit for the beach in emerald green and white shot silk trimmed with black velvet ribbon was described as 'in Louis XV style'. Rounded and more voluptuous curves finally triumphed over the vertical. The upper skirts were drawn up and back, the underskirt becoming the main skirt, and were supported by a kind of decadent crinoline called a crinolette, with hoops at the back only. The age of the crinoline had given way to that of the bustle.